Students learn the basics of the English language in safe and fun environment. It is important to us that our students gain a thorough knowledge of the basics. We have designed our curriculum with this in mind. The foundation of this curriculum is our carefully planned lessons. Furthermore, ensure our students develop their communication skills so that they can use what they have learned in any situation without hesitation. First year junior high school students have ten hours of lessons related to the English language each week. Four hours are spent in classes designed to teach basic skills using a recognized textbook. 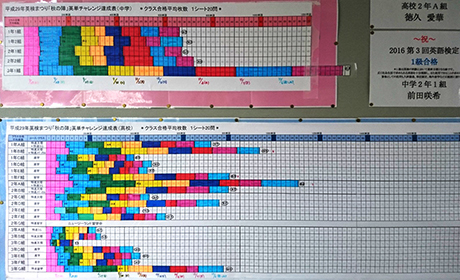 Another two hours are spent in practicing the skills needed to pass the Eiken examinations. These classes are all taught by Japanese teachers who ensure the students master the basics. Beginners are placed in a different class to those with previous experience studying English. This ensures that all students are instructed at a level that is suited to their needs. Furthermore, each week the students have two hours of English conversation classes with native English speakers. These classes are also divided by skill level and take place during general studies time. We also offer immersion music and art classes taught by native speakers of English. The students join these classes for two hours each week. 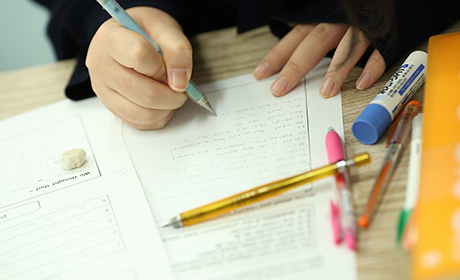 Our junior high school English classes are taught in small groups based on the students’ English level. An advantage of this system is that we can offer personalized instruction. Each term, the students have interview tests, make presentations, and take part in inter-class speech contests. These contests give each and every student the chance to speak English in front of others. Through conveying their own thoughts and opinions to other people in English, the students soon learn that the English language is a tool for meaningful communication. This is closely linked to the growth of their English language skills. Each January we offer a school trip to New Zealand for our third year junior high school students. During this trip, students experience a farm-stay for two nights, visit local educational institutions and participate in many other such activities. The trip is designed to ensure our students experience everyday life in New Zealand and come into contact with the local culture. In Auckland, students carry out their own independent group activities. 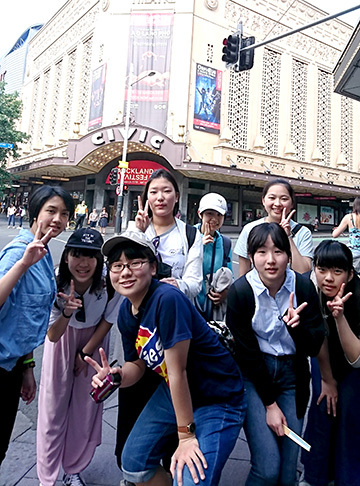 Students travel around Auckland in small groups visiting shops and sightseeing spots independently based on a plan they have made before arrival. This gives them the opportunity to use English pro-actively and put all they have learned at junior high school to use. 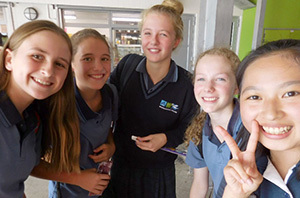 It also gives the junior high school students a small taste of the lives of our KGGS Study Abroad Course students and helps them to consider how they want to use the English language in their own future. 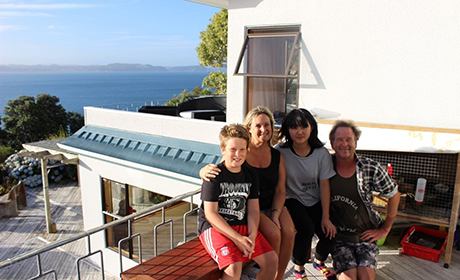 After the school trip to New Zealand, students have the option of staying in New Zealand for around two months. 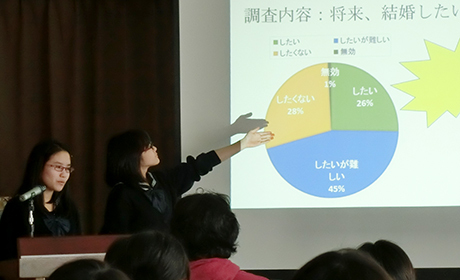 This is our Junior High School Study Abroad Program. Through attending school abroad and living with a home stay family at this young age, our students not only improve their English language skills, but become more mature and independent. 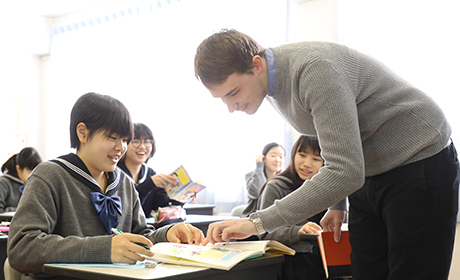 Our high school offers both the “KGGS Study Abroad Course” and the “Short Term Language Exchange in England.” In this way, students can choose how they wish to develop their English language skills further. Every year during the summer break we offer our English Summer Camp. Students have the option of spending 1 night and 2 days immersed in English. Students are divided into small groups to enjoy a wide range of activities in English. These include games, sports, skits and scavenger hunts. Throughout the camp the students are supported by our native English teachers and are encouraged to communicate solely in English. This event helps our students to improve their English language skills in a fun and natural way. 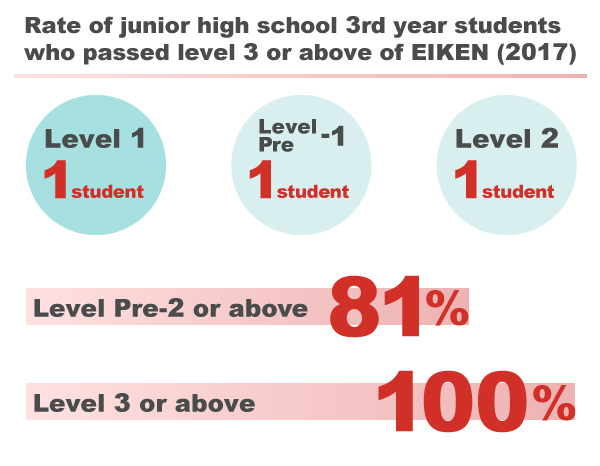 100% of students achieve Eiken level 3 or aboveThe success of our Eiken festival! We hold our Eiken festival in June and October each year. The aim of this event is to encourage students across the whole school to actively prepare for the Eiken examinations together. Students encourage, assist and challenge each other. This creates an environment where studying for Eiken becomes fun! Moreover, through taking on the challenge together, our students are able to improve their scores quickly. This event is closely linked to the fact that recently 100% of our students have passed Eiken level 3 or above before graduation! This prize is awarded to institutions that have an exceptionally high pass rate in the Eiken examinations. In 2017, we were the only private junior high school to be given this award.